While there are no beaches in Boston, a half-hour drive or train trip will take you to wonderful sandy stretches overlooking Boston Harbor. 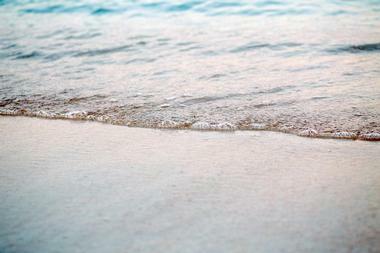 Most beaches are sandy, with a mix of pebbles and crushed shells, and are refilled at times, making the water murky. However, there are no waves and the slope to the water is gradual, making these beaches a kids’ delight. Carson Beach is a popular public beach in the South Boston neighborhood, a part of a 3-mile-long line of parks along the Boston shoreline. The beach is sandy and smooth, with lovely views of Boston Harbor. It is suitable for swimming only in the midsummer, and the water is cold most of the year. 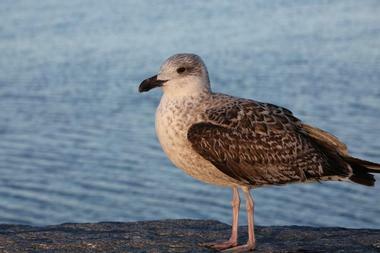 It is the westernmost beach as you head from the Castle Island, after the L and M Street beaches. The old bathhouse has been renovated recently, the water quality is strictly controlled, and the facilities are extensive. The beach became notorious after the racial conflict in the mid-70s, when African American residents demanded equal access to the beach and the bath house. 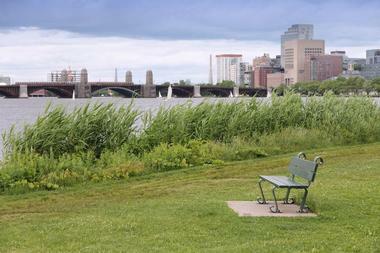 The Esplanade is a wide, long wooden pier stretched along the Boston side of the Charles River. 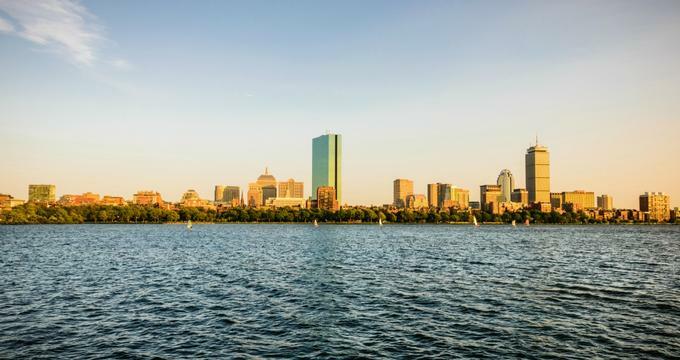 While not technically a beach, the Esplanade offers the only sunbathing spot on the water within the Boston city limits and is very popular on hot summer days. There is no access to this reservation land except on foot or by bike. After crossing the pedestrian bridge over Storrow Drive, walk along the river until you reach the massive stone patio with the staircase going down to the pier. This 3.5-mile-long walkway is very popular with walkers, joggers, rollerbladers, and bikers. It often hosts public events such as the Boston Pops annual concerts at the Hatch Shell. Located on William J. Day Blvd. on the shore of Boston Harbor, Castle Island has been the strategic location for a fort since 1634. The latest in the line of fortifications is Fort Independence, today a popular tourist attraction. While in the past it was located some way from the coast, a narrow causeway was built in 1928 and connected Castle Island to the mainland. The island is currently a popular 22-acre recreation site linked to City Point Beach and Pleasure Bay Beach. The 2.2-mile loop hiking trail around the island is perfect for running, relaxing, or enjoying the views. There are picnic tables, benches, grassy areas, and a small pebbled beach perfect for kids, with a gentle slope into the water. City Point Beach is one of several beaches located on William J. Day Blvd. overlooking Boston Harbor. You can walk from the City Point Beach to Pleasure Bay Beach and Castle Island. The island offers a 2.2-mile-long hiking and biking trail, a line of benches for enjoying the view of the harbor, and a kids’ playground. The beach is pebbled and the slope to the water is gradual, perfect for the kids. Dogs are allowed on the leash only during the off-season. There are several picnic tables under the gazebo, and Marine Park and City Point Park across the street have kids’ playgrounds. Constitution Beach Park is a great option for Boston residents who are looking for a different and less crowded beach to enjoy. Located on Bennington Street, Constitution Beach is not very big, but it is wide and spacious enough to offer space for families to have some fun in the sun. The bonus is the view of the airplanes landing at nearby Logan Airport. 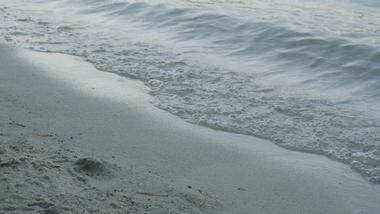 The soft sand mixed with shells is perfect for kids to run around on. The sand has been brought in, does not pack well and makes the water look murky, but the slope into the water is gradual, there are never any waves, and kids enjoy it very much. There are even some newly planted trees to provide shade. 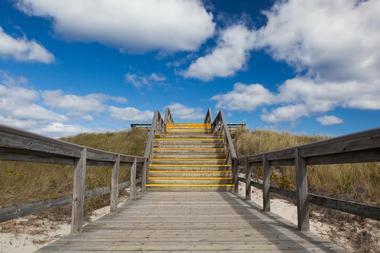 Crane Beach is considered one of the Northeast’s most beautiful beaches. 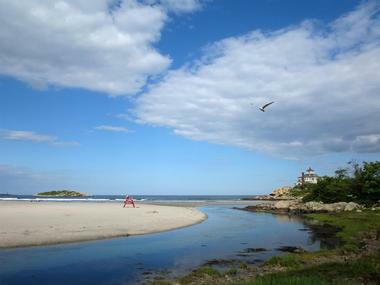 This 1,234-acre conservation and recreation area is located in Ipswich, just north of Cape Ann. The 4-mile-long beachfront is backed by massive dunes and a pitch pine maritime forest. There are 5.5 miles of well-maintained hiking trails through the large dunes and the forest, which can be accessed from the beachfront. 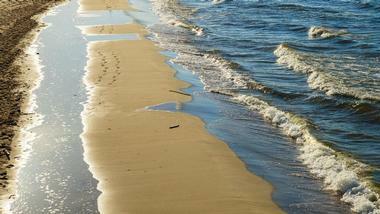 When the tide is low, you can wade to the exposed sand bars, and during the summer small boats can dock on them. You can see Plum Island from the beach. Crane Beach is one of the world’s most important nesting locations for endangered piping plovers, with a well-known and successful protection program. 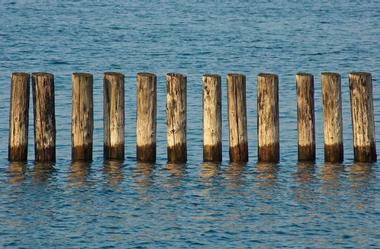 The wrack – the line of washed-up debris where the birds hide and feed – is fenced for their protection. Half Moon is a lovely small half-moon shaped beach in historic Stage Fort Park. The beach offers nice views of downtown Gloucester and Stacy Boulevard. It is surrounded by large rocks, dense vegetation, and trees, creating a protected, secluded inlet that is perfect for families with kids. As the beach is fairly small and enclosed, it is not difficult to keep an eye on the kids, although there are lifeguards on duty from Memorial to Labor Day. There is a nice visitors center that offers restrooms and several picnic areas with grills, tables, and benches. No alcohol is allowed on the beach. M Street Beach is one segment of a 3-mile-long stretch of beach within the city of Boston. While linked to Carson Beach, M Street Beach does not offer all the amenities Carson Beach does. It has a quaint “local” feel to it, and even the parking around it is restricted to locals. The sand beach is soft, fairly rocky, mixed with small pieces of shell. The sand has been brought in and is not well packed, so it tends to make the water look muddy and the sand is quite soft. 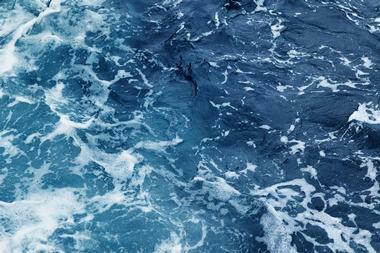 Nevertheless, there are no waves, the water is always calm, and kids love playing in it. The beach is a very popular cool-off spot for people coming out of the Curley Community Center after a hard workout. It is also a pleasant place for long walks along the shore with family. Malibu Beach is one of several Dorchester beaches just off William T. Morrissey Blvd. The east end of Malibu Beach faces Dorchester Bay Basin, providing a nice view of the iconic painting by Corita Kent on the National Grid gas tank, the largest public art piece in the States. 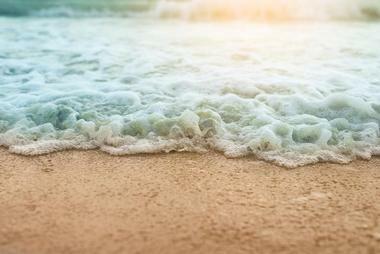 Some parts of the beach do not have much sand, especially during high tide, but there is enough grass to sit on as well as plenty of benches and trees to provide shade on hot summer days. The bathhouse and the park grounds are fairly new. The area around the beach and throughout the park is well lit for those who like nighttime jogs or walks. Malibu Beach is particularly popular with college students and local residents. Pleasure Bay Beach is a popular summer cooling-off spot in Boston, a half-mile-long beachfront located next to the Massport’s Conley Terminal, right alongside 2,000 feet of docking, 60 acres of container storage, and six huge loading gantries. The beach is part of a park that is a brainchild of the famous Frederick Law Olmsted, who in 1897 suggested a continuous parkway from Franklin Park to Marine Park. The projects later connected Castle Island to the mainland. Pleasure Bay Beach is adjacent to City Point Beach and Castle Island, with the 2.2-mile hiking trail popular with runners, dog walkers, and nature lovers. 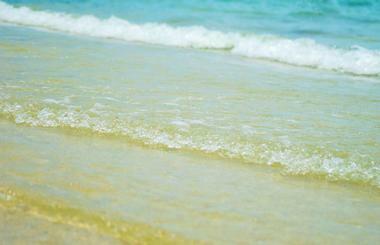 The pebbled sand gradually slopes to the water, making the beach perfect for kids. One of Boston’s landmarks, Revere Beach is a large public beach in Revere, Massachusetts, about 4 miles from downtown Boston. 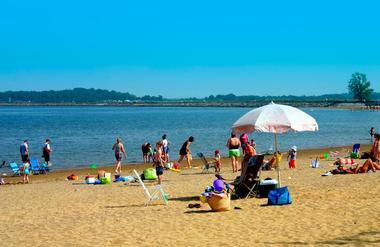 Founded in 1895, Revere Beach is the oldest and the first public beach in the country. If you do not like crowds, find another beach. 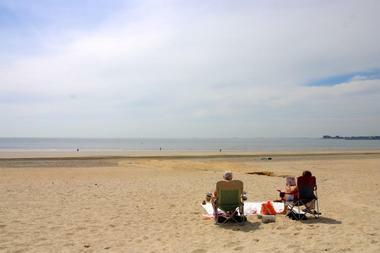 On a hot summer weekend, you can find over 250,000 sun worshipers stretched along Revere's sandy shores. The beach is famous for a whole line of festivals, such as the annual New England Sand Sculpting Festival, when the large part of the beach becomes a sand art gallery. There is almost always some kind of music blasting from the bandstand. Being easily accessible by public transport, the beach is a very popular place for Bostonians of all kinds to relax and grab some sun. Savin Hill Beach is part of a chain of beaches in the Dorchester neighborhood of Boston that provide access to the sandy coast along the wide mouth of the Neponset River. Malibu Beach is known for its bathhouse and pleasant, protected swimming. Victory Road Park, constructed on the reclaimed land, is full of verdant indigenous planting. Tenean Beach has a playground as well as basketball and tennis courts, while Savin Hill Beach has been restored to its 19th century original Olmsted Brothers design and has a baseball field, a tot lot, and a protected swimming area. 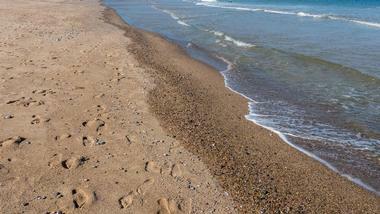 The beach consists of a long, narrow strip of sand mixed with pebbles and shell bits, steps from the water. 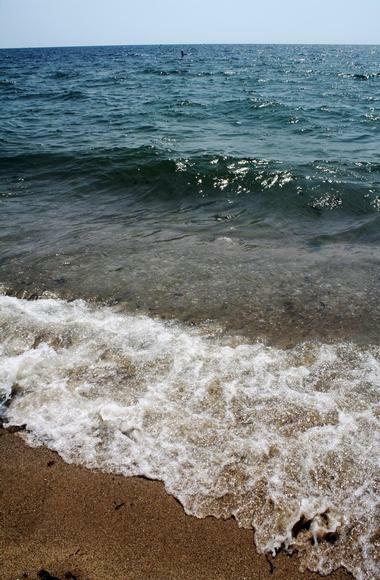 The water is always calm, making Savin Hill Beach perfect for kids. Tenean Beach is a small, quiet beach on Conley Street in Boston, much more popular for beach activities than for swimming. There are often signs warning “No Swimming, Swimming May Cause Illness” all over the beach. But, with a fair amount of sand, the beach is great for playing sports, since there are tennis courts, a basketball court, a playground, the link to the Neponset Trail, and great views of the Boston skyline. For some reason, the beach is rarely too crowded, making it a perfect destination when other local beaches are packed. The Neponset Trail is popular with dog walkers, runners, and anyone else enjoying a quiet and safe walk. Wingaersheek Beach is located at the end of Atlantic Street, along the beautiful Annisquam River and Ipswich Bay, in the Dorchester neighborhood of Boston. The beach is spectacular at low tide, when it stretches out for hundreds of yards, exposing a long sandbar and making it perfect for a walk. The beach has lifeguards on duty from Memorial Day to Labor Day. Surfing and all flotation and inflatable objects are not allowed while the lifeguards are on duty. Alcohol is also not allowed. Visitors have to take all their garbage with them, a part of the Carry In – Carry Out policy.